Wir haben zwei tolle Neuigkeiten zum BANJOREE 2011. Zunächst mal konnten wir Elly Beurskens aus Holland gewinnen, einen Clawhammer-Workshop zu leiten. Der Schwerpunkt in diesem Workshop liegt in der Begleitung von Gesang und anderen Instrumenten. Der Schwierigkeitsgrad wird auch von Anfängern zu bewältigen sein. Elly wird ihren Workshop multimedial gestalten, das heißt nicht nur, dass sie neben dem Banjo ein Whiteboard und einen Filzstift benutzt, sondern obendrein auch noch eine Videopräsentation. Bruno van Hoek wird auch mitmachen und sich demonstrativ von Elly begleiten lassen. Der Wermutstropfen: Leider entfällt der Workshop von Cera Impala. Für fortgeschrittene Anfänger und Profis gibt es natürlich nach wie vor den beeindruckenden Workshop von Udo Weihrauch. Und dann hat sich Lluis Gomez [left] aus Barcelona angemeldet. Er wird Tom Nechville bei seinem Setup-Workshop unterstützen. Tom zeigt Setup-Varianten und Möglichkeiten, Klang und Bespielbarkeit zu verbessern - Lluis demonstriert den Effekt. Mehr infos: www.banjoree.com und dort unter 'Workshops'. 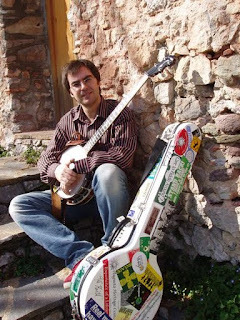 Und das Beste von allem: es sind noch einige Plätze beim BANJOREE 2011 (13.-15.05.2011) frei. There are good news from BANJOREE 2011. First we are proud to present Elly Beurskens from Holland who will conduct a clawhammer workshop. The focus of this workshop will be the backup of songs and other instruments. The level of the workshop will also be feasible for beginners. Elly will make use of multimedia techniques which means that she not only uses a marker and a whiteboard but also a video presentation. There also will be plenty of room for the participants to try out what they learned. Bruno van Hoek will also be there to demonstrate how he can be backed up. Unfortunately the workshop of Cera Impala is cancelled. For the intermediate to advanced there still will be the workshop of amazing Udo Weihrauch. Lluis Gomez from Barcelona also has announced his appearance. He will support Tom Nechville with his setup workshop. Tom will show us various types of setup and ways to improve sound and playability of the instrument and Lluis will demonstrate the results. More information: www.banjoree.com, then go to 'Workshops'.